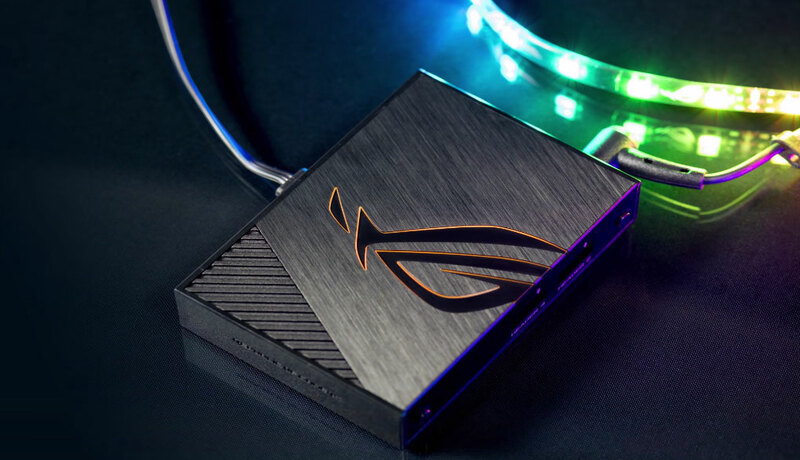 It seems that we are in a race to see the most absurd product with RGB lighting, touching the turn today to the Asus ROG Aura Terminal, a small box that has the functionality of controlling the RGB LED lighting of the system, at the same time illuminating your table with its integrated RGB lighting. For this, it has a total of four 4-pin connectors where each one supports a total of 90 LEDs, although it will be of little use, because in total, we will be limited to 210 LEDs. At least the Asus ROG Aura Terminal does not seem so bad, if its “Halo” technology works perfectly, which translates into being able to place a pair of RGB strips behind your monitor to offer a greater depth of immersion in the games, it is as if we gave our monitor the already known ambient mood-lighting. This requires a USB 2.0 head (connect directly to the motherboard), and powered by a 4-pin Molex connector. The package includes two 30 cm and one 60 cm RGB LED strips, a 45W power adapter, a Molex to 2-pin DC adapter, a 9-pin USB 2.0 header to USB type-A adapter, stickers, and cable ties. As expected, its price will take away the desire, almost 80 euros.